The Northwest's endangered salmon are losing their best friend. Earlier this week, U.S. District Judge James Redden notified lawyers in a 17-year legal battle over how to restore threatened and endangered fish runs in the Columbia River basin that he plans to step down before 2014. That's when the federal government is supposed to produce yet another court-ordered plan that would allow endangered salmon and hydroelectric dams to coexist on the Columbia River. Redden has rejected three different federal government plans, prodding the federal government and other parties to do more to reverse the decline of the Northwest's once-prolific runs of wild salmon. The judge's clear-eyed focus on the requirements of the federal Endangered Species Act -- and the flaws in the government's "biological opinions" -- already have done much to help salmon. Because of Redden, the federal government has made unprecedented commitments in water, hydroelectric operations and habitat improvements. He has demanded greater collaboration in Columbia salmon recovery by federal agencies, Northwest states, Native American tribes and other groups. Because of Redden's unflinching oversight, the government has committed tens of millions of dollars in additional federal spending to salmon recovery. 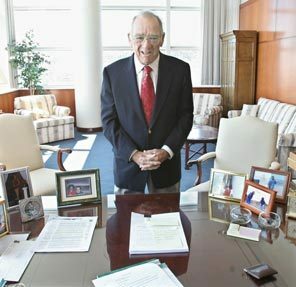 Now 82, Redden was appointed to the Portland-based federal court in 1980 after a distinguished political career in which he served as a Democrat in the Oregon Legislature and as state attorney general and treasurer. But he is more likely to be remembered as the salmon's strongest defender -- and some might say, their best hope for survival. When the federal government eventually produces a plan that puts the salmon on a trajectory toward recovery, Oregonians should remember that it was Judge Redden who required the government to make every effort to ensure the long-term survival of the Northwest's most iconic species.